Kenyans currently face a lack of available, qualified health care providers, a lack of access to health care services and prevention treatments, and a lack of affordability to receive care. JRJFI is working to counter these challenges in Kenya through the Kenya Women and Children's Wellness Centre. The Centre - a state-of-the-art health care facility, will cater to the needs of women, children, and families, currently unable to receive needed care, support, and counseling in a country which faces issues of gender-based violence, high maternal mortality rates, and a high prevalence of HIV/AIDS. 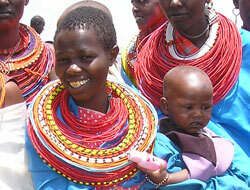 To learn more about the need for up-scaled health initiatives in Kenya, please visit our Healthcare page. Gender inequities exist in all societies and are related to health problems: there is strong evidence that gender inequalities increase vulnerability of women and girls to HIV, comprise the effectiveness of HIV prevention and create barriers to effective HIV treatment and care. Research has shown that the impact of violence against women on development progress goes beyond short-term injury and disability. It has been established that gender-based violence leads to the isolation and even ostracism of the victims, and ultimately, to longer-term mental, medical and economic consequences. To learn more about gender-based violence and our work, please visit our GBV page.